Red wine has a special place in everyone’s heart. The best red varietals encompass the full range of sensory experience, from the dense, bold flavors of a Cabernet Sauvignon, to the elegant and lively Pinot Noir. As with all varieties of wine, the winemaking process for red wine has its own particularities and unique stages. Here in Brooklyn, it all begins with the arrival of the grapes at our urban winery. 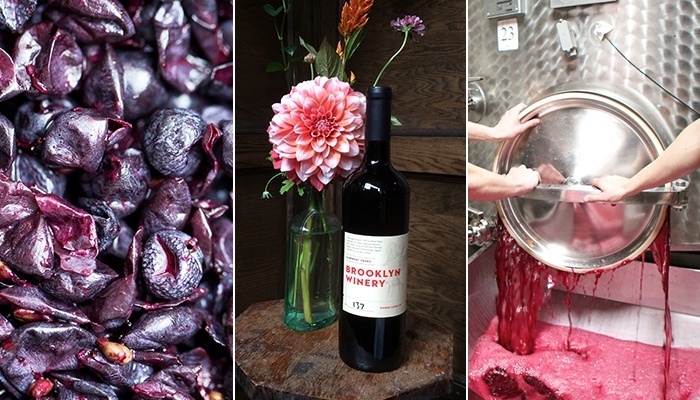 First, the fruit is delivered to Brooklyn Winery as whole berry clusters, meaning the fruit is still on the stem. It is immediately hand sorted, and clusters that are less than perfect are discarded, along with any leaves that may have slipped in there. We then use a mechanical destemmer to gently separate the berries from the stems. The grape must is then transferred to a fermenting vessel, (generally a stainless steel tank or t-bin) and a very low dose of SO2 is added to prevent the oxidation of the fruit (imagine an apple turning brown just a few hours after it has been sliced—we don’t want that). The fermenting vessel is then sealed and an inert gas (typically argon) is added to the head space to simulate the “blanket” that occurs during fermentation which protects the must from oxygen. Because the fruit is shipped in a temperature controlled container, we have to wait until the must reaches an acceptable temperature for our yeast to awaken, multiply, and grow. This is usually achieved in one or two days; as the fruit naturally warms, it allows for a gentle extraction of color, texture, and delicate aromas contained in the solids. When the temperature is right—between 60 and 64°F—we proceed with the yeast inoculation. Inoculation is the addition of yeast to the grape must. The yeast feeds off of the sugar and produces alcohol and carbon dioxide. During the alcoholic fermentation, as a result of the carbon dioxide production, the skins rise to the surface of the fermenting must, creating what we call the cap. When the ferment is most active, the cap is manually reintroduced into the liquid two or three times a day to enhance color and flavor extraction and to avoid “suffocating” the yeast cells (we want our yeast nice and happy!). This is done by performing punch downs if the vessel is an open top container and easily accessible, like our small t-bins, or with a pump over if the must is in one of our larger stainless steel tanks. The time necessary for the must to complete the primary fermentation may take anywhere from a week to a month. The fermentation process is considered complete when all sugar has been successfully converted into alcohol. This is one of the most critical parts of winemaking—sugar levels are checked constantly to make sure that fermentation is running smoothly: too fast and the yeast will produce more heat than it can handle, too slow and the amount of the carbon dioxide produced will not be enough to protect the fermenting must from oxygen. When the alcoholic fermentation is complete, the juice (called “free run”) has to be separated from the solids. This is done by draining the vessel with either an impeller pump attached to a mesh filter submerged in the must, or through the draining valve of the stainless steel tank. To extract the juice from the remaining solids, we use a bladder press. The fermented and boozy solids are manually loaded into the press with buckets or shovels and gently pressed to extract the precious liquid. The red wine is then drained and pumped into oak barrels where it will go through a secondary fermentation process called malolactic fermentation. During this second fermentation, the sharp, astringent malic acid is converted into lactic acid, which is rounder and softer on the pallet. When malolactic fermentation is complete, the entire lot is racked into a stainless steel tank, and SO2 is added to stabilize and protect the wine from any oxygen. The barrels are then washed with hot water to remove the heavy lees leftover from fermentation, after which the wine goes back into clean barrels to begin the aging process. While aging, the red wine rests peacefully in our temperature controlled barrel room. During its life in barrel, the wines are racked at least two to three times to ensure a healthy and clear wine. The barrels are also topped regularly to make up for any wine that has evaporated through slow oxidation or been absorbed by the oak. Parameters like free SO2, TA (Titratable Acidity) and VA (Volatile Acidity) are also checked regularly to make sure that the wine is developing as expected. Before bottling, the red wine is filtered to make sure it is clear and free of any microbial bacteria. The bottles are then aged for three months to one year, and released once our winemaker deems them ready for consumption. While it is a long and laborious process, it is all worth it when we pour the first glass of a new delicious red wine! 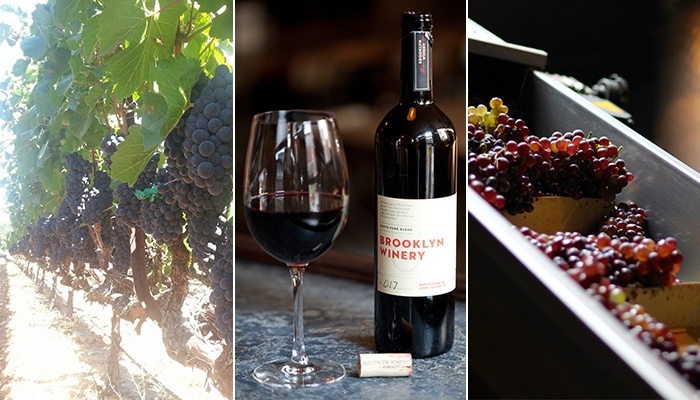 Browse Brooklyn Winery red wines!